Planning to visit Mexico soon? 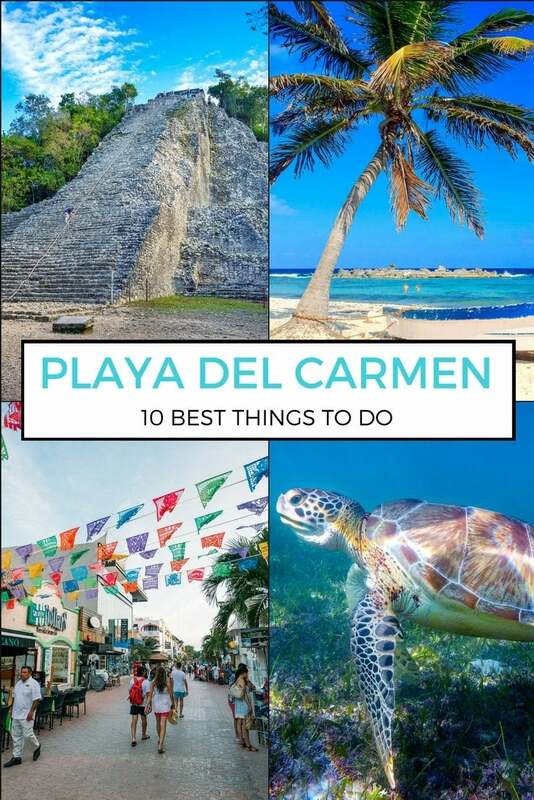 These are my favorite things to do in Playa del Carmen after living here for over a year. Sunbathing on beaches, exploring cenotes, visiting Mayan ruins and more. 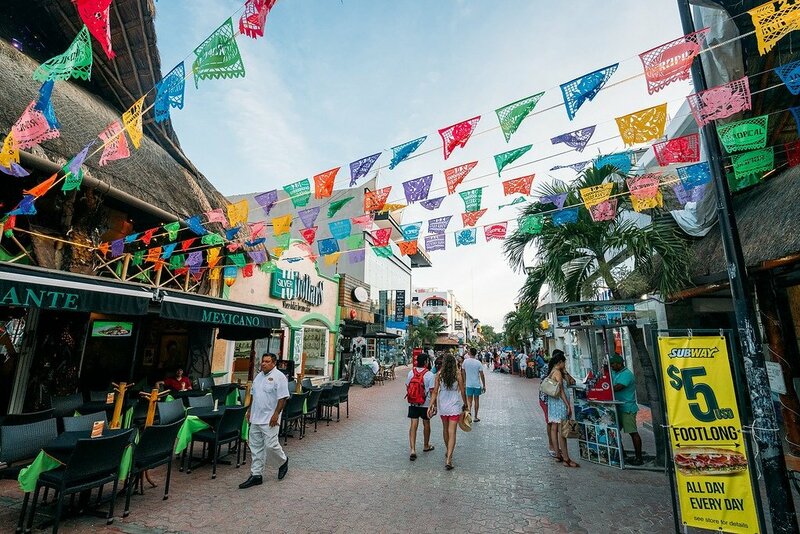 Playa del Carmen is a fun beach town on Mexico’s Yucatan Peninsula, part of the classic Riviera Maya route down the coast. Smaller and less touristy than Cancun, it’s becoming a popular travel destination for people looking for travel experiences that are more substantial than your typical all-inclusive resort. I spent over a year working & living in Playa del Carmen, and have had a wonderful time. 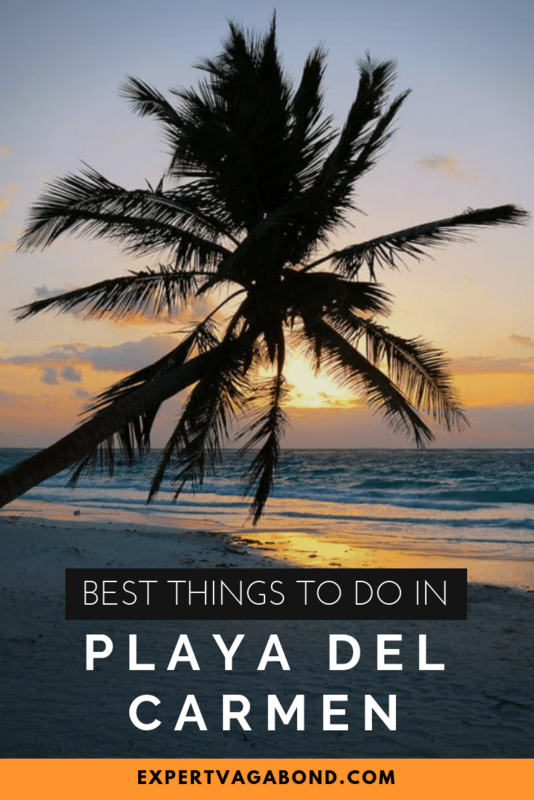 Lately, friends have been asking for advice about Playa — so I wanted to share some my favorite things to do here. What’s a cenote you ask? It’s an underground cave filled with fresh water. The Yucatan has tons of them — sinkholes that open up into underground rivers with the clearest water you’ve ever seen. If you have your PADI license, you can go scuba diving in these caves with a guide. Because there’s daylight near the entrance a more technical cave diving license isn’t required. Not a diver? No problem. You can also go snorkeling at most cenotes. 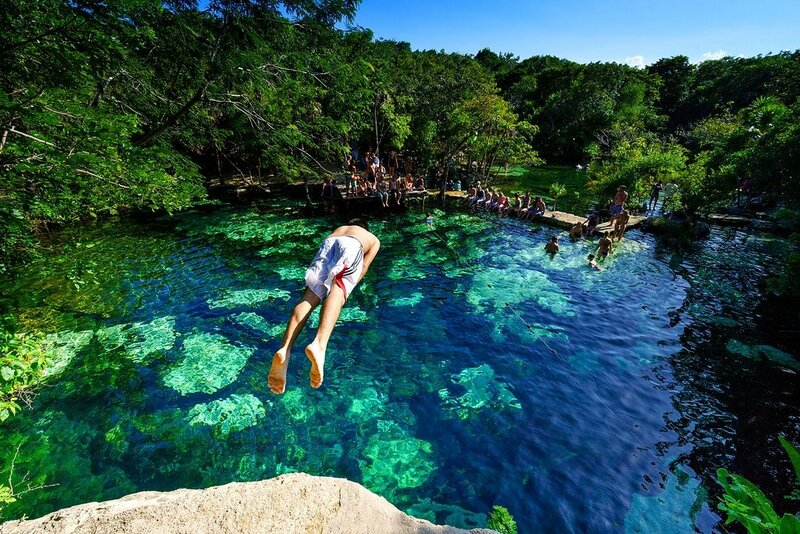 Some good ones include Cenote Dos Ojos, Cenote Azul, Garden of Eden, Gran Cenote, and more. The ancient Mayan ruins of Tulum are located South of Playa del Carmen in the town of Tulum. Tulum was once a small but important port city that sits on the edge of a cliff, with a beach below where you can swim too. Because Tulum is so popular, the ruins can be crowded unless you arrive early in the morning. 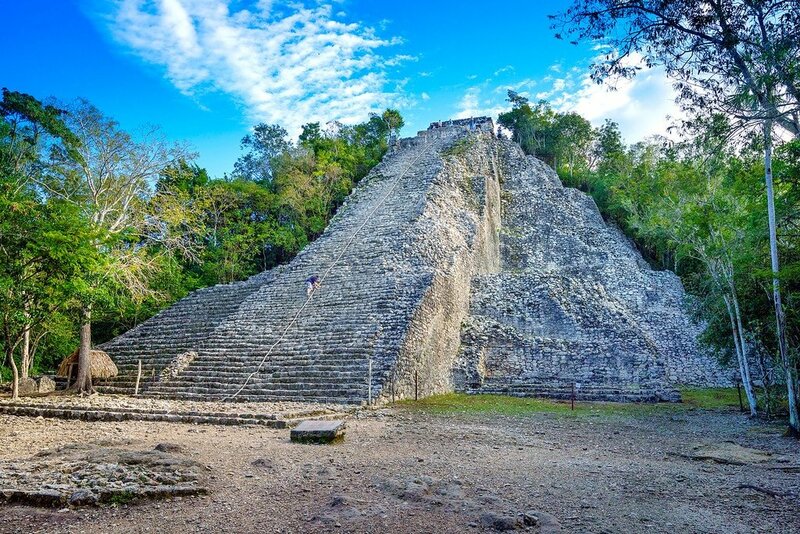 Coba is another Mayan site near Playa del Carmen which sees less visitors. You can even still climb the pyramid there too! Of course everyone who visits the Yucatan Peninsula wants to check out Mexico’s most famous ruins, Chichen Itza. This site is a bit further away, about 2 hours by car. Playa del Carmen’s nightlife is fun, but not quite as crazy as Cancun. It’s a smaller town. 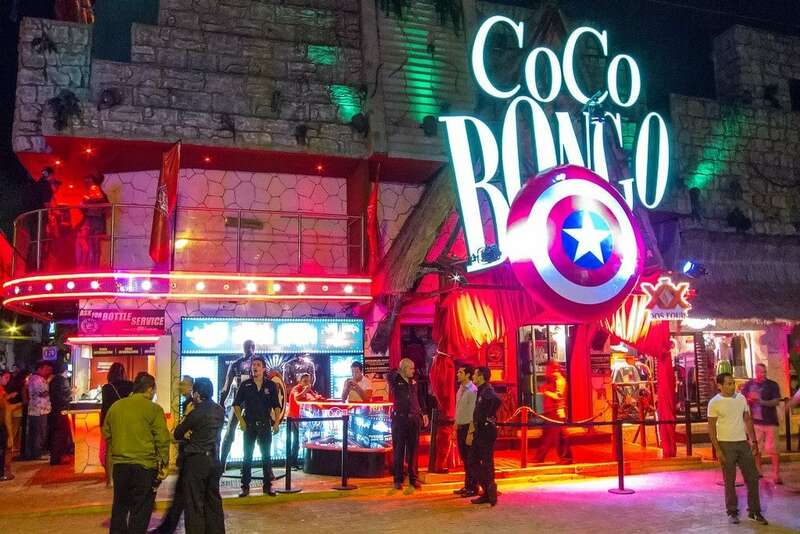 However it does have one special nightclub called Coco Bongo that I think is worth a visit. Part Vegas show, part nightclub, and a bit cheesy — but it’s still one hell of a party. You’ll see flying acrobats, blockbuster movie characters, and rock-star impersonators take the stage in turns throughout the night while you drink from a giant plastic cup full of alcohol. Every ticket includes full open bar all night, so take plenty of photos because you probably won’t remember what happened the next day! 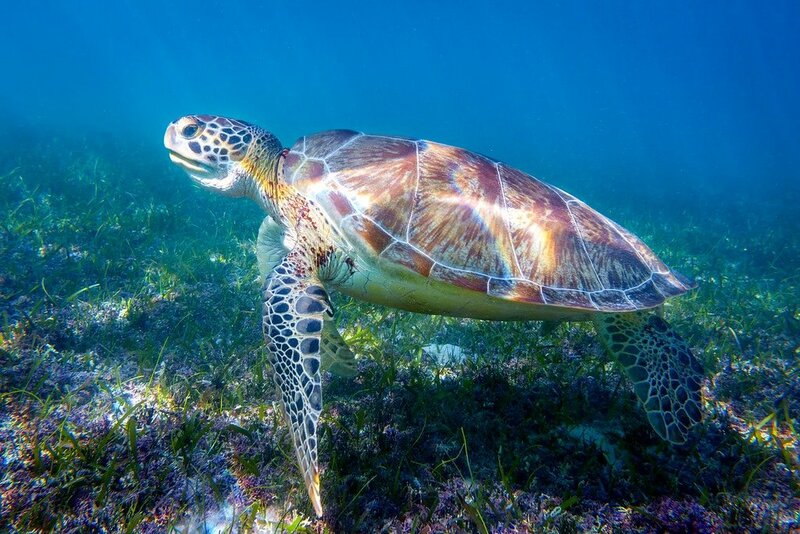 Who doesn’t want to swim with sea turtles? I’ve always wanted to, that’s for sure. I got my chance at Akumal beach, 30 minutes South of Playa del Carmen. The shallow blue-green water here is home to Green, Hawksbill and Loggerhead sea turtles that you can swim with. To visit Akumal, the cheapest way is to take a colectivo taxi headed for Tulum from the stand located on Calle 2 Norte between Avenida 15 and 20 in Playa del Carmen. Tell them you want to get off at Akumal. From the highway, it’s a 5-minute walk to Akumal Bay. Bring your own snorkeling gear, life jacket (compulsory since 2017) or rent some there. Swimming with the turtles is free! Hey, it’s Mexico. Mexican food in the Yucatan is cheap & delicious. There are a few special restaurants in Playa del Carmen I want to share with you. 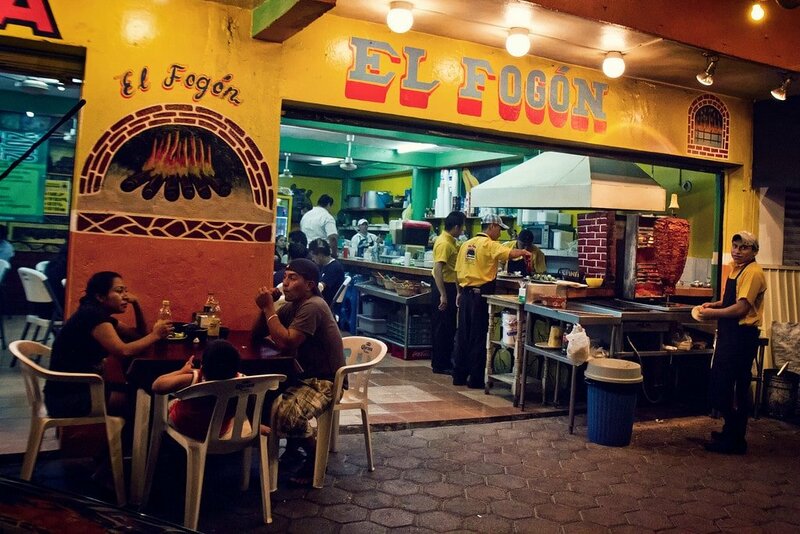 If you’re looking for some authentic tacos, check out El Fogon. It’s a hangout for local taxi drivers. The place is super basic with plastic chairs and Mexican Idol blaring on the TV, but order 3 or 4 tacos pastor, a cold beer, and you’ll be in heaven. Next, for something more upscale, check out Alux, the restaurant built inside an underground cave! Aluxes are mischievous supernatural spirits who protect Mexico’s sacred places. Cozumel is a small island off the coast of Playa del Carmen known for it’s pristine beaches. Normally a stop for cruise ships, you can take a 45 minute ferry over on your own from Playa del Carmen for about $13 USD. An easy & cheap day trip is renting a scooter and driving it around the island where all the best beaches are. Or, if you’re feeling extra adventurous, you can try hitchhiking around the island instead. As long as there isn’t a cruise ship in port, you’ll have those white sand beaches to yourself. Plenty of stops on the way for lunch & photos. Jump on the last ferry back to Playa del Carmen around sunset. 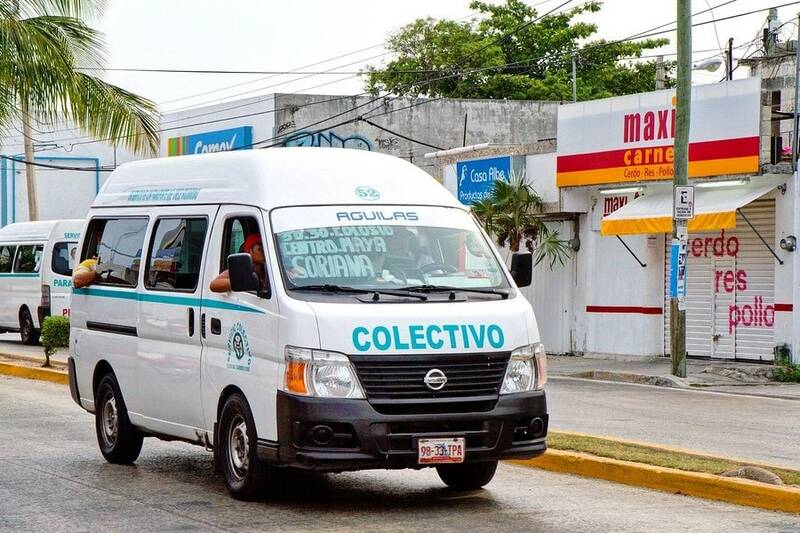 You can’t visit Playa del Carmen without using a Colectivo (group taxi). You’ll see these vans cruise down the street picking up locals. It’s an interesting (and confusing) experience if you’ve never tried it before. They stuff as many people as possible into these things, and rides can cost less than $1. Destinations are written on the windshield, but if you don’t know the names, it won’t make much sense. 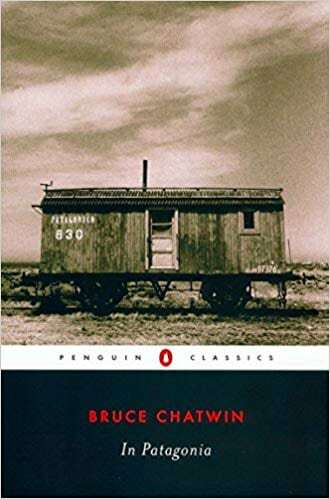 A good place to start is by grabbing one at the Colectivo station on Calle 2 Norte from Playa del Carmen to Akumal beach (mentioned earlier). Remember to tell the driver where you’re going! 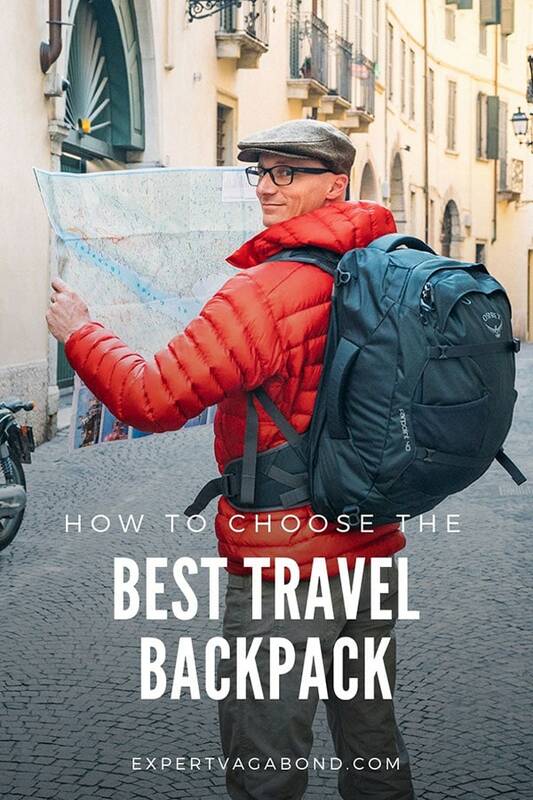 It’s cheap, fun, and will push you out of your comfort zone a bit. 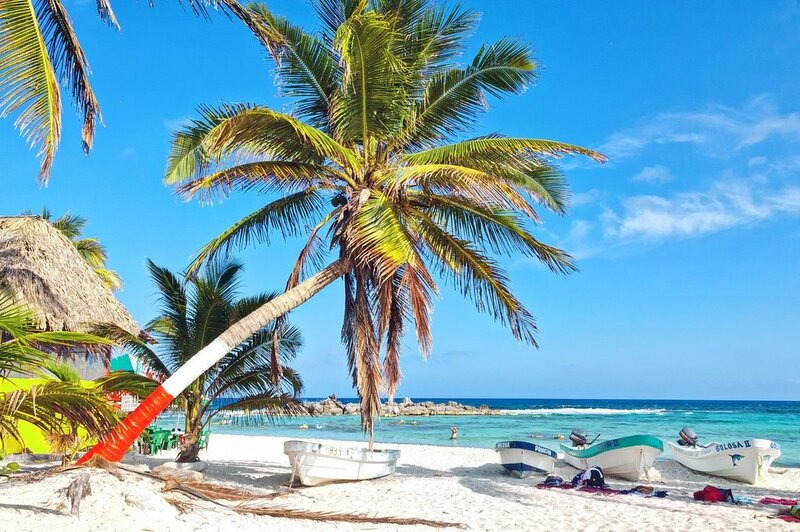 Playa del Carmen is a great place to base yourself if you’re a scuba diver. Along with all the cool cenote cave diving areas I mentioned earlier, there are some decent reefs nearby too. A few of the most popular are Pared Verde Ledge and Tortugas near Playa del Carmen itself, Gorgonians down near Akumal, Palancar Reef and Santa Rosa Wall off the coast of Cozumel. 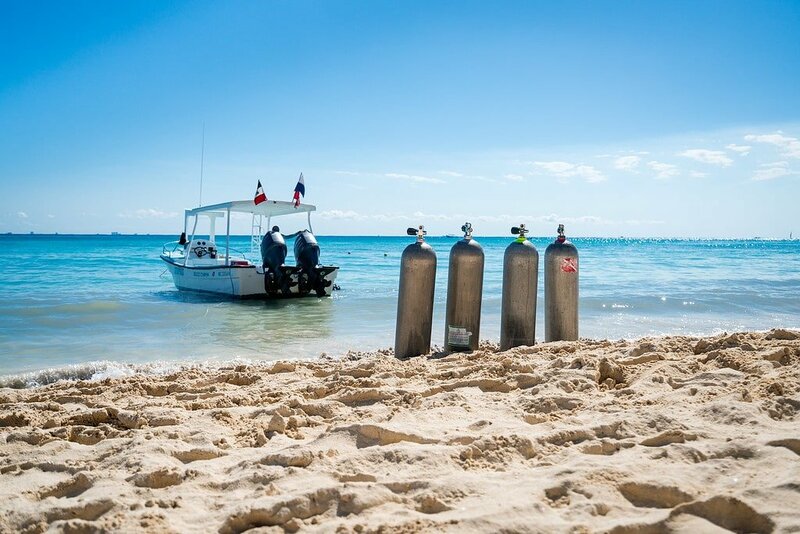 There are tons of dive shops and schools in and around town, so if you’ve always wanted to get your PADI open water diving certification, Playa del Carmen is a great place to do it! 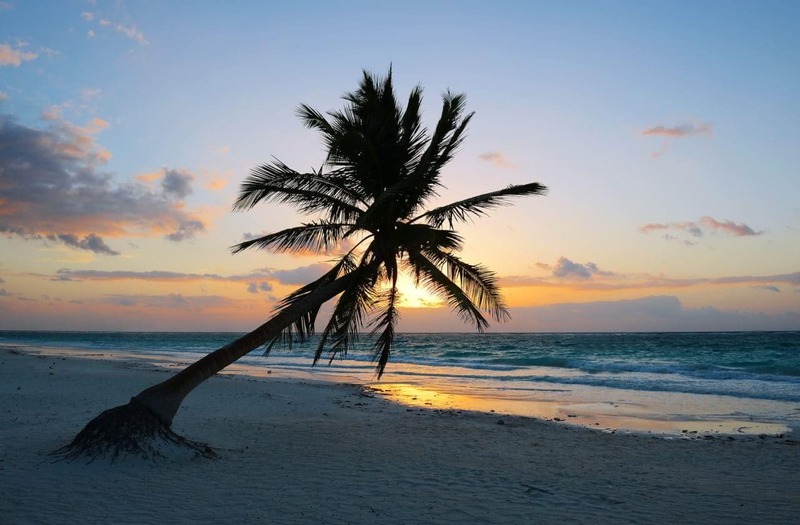 Playa del Carmen’s beaches have been hit be erosion pretty badly over the past few years, and frankly the beaches down in Tulum are a lot nicer, however, you can still find a spot to soak up the sun while enjoying a fruity drink. One great place to lay out in the sun is Mamitas Beach Club. 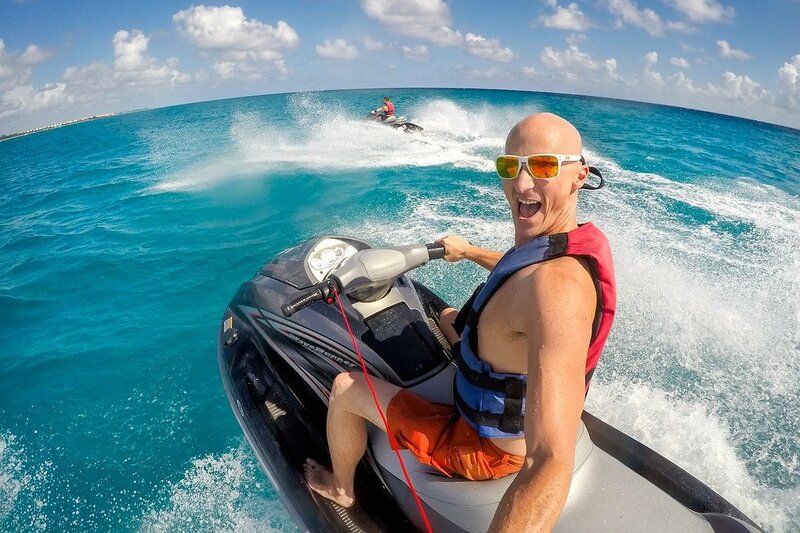 You can rent lounge chairs with umbrellas, go jet skiing, parasailing, or take a sailboat ride. Another good beach is in front of Playacar Phase 1 Community. While the gated community is private, the beach is public. Just walk a few minutes South from the Cozumel Ferry Pier. Fewer tourists, more sand, and just a nicer beach. There are no services out there — bring your own food/beverages. You can’t visit Playa del Carmen and miss walking down “La Quinta”, aka 5th Avenue. It’s the main walking-street lined with all manner of shops, beach bars, and restaurants. The cobbled-stoned street is where you’ll find most of the city’s nightlife. It’s a lot of fun to find a bar or cafe, sit down, and watch the (sometimes strange) parade of people walk by. You can spend hours wandering down the street, stopping into touristy shops, cafes, and trying different vegan smoothies. At night, street performers line the sides dressed in costumes, or breakdancing for tips. If you’re wondering where to stay in Playa del Carmen here are my recommendations depending on your budget. Have any questions about things to do in Playa del Carmen? What about other suggestions? Drop me a message in the comments below!